Various applications call for various traction solutions so Bobcat has several. 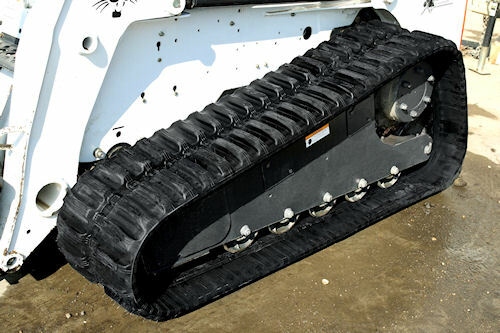 Bobcat track loaders, compact excavators and mini-track loaders are used in a variety of applications, so the company has begun offering choices in tread patterns for its track replacement customers. The new EarthForce H-pattern rubber tracks are a broad-spectrum solution to many uses for Bobcat's machines. The H-pattern features a pyramid construction for even weight distribution and wear, along with specially designed features to prevent lug cracking damage to the track body. Continuous cable belting also adds to longevity, along with forged, heat-treated steel links and proprietary rubber compounds. Bobcat is offering choices of tread patterns for various applications in its tread replacement lineup. There's also a multi-bar lug rubber track available for mini track loaders. The double offset tread patterns contains the growth of cuts and cracks and protects the track body from damage. The multi-bar track is especially suited for use in snow. More information on the new "shoes" for Bobcats is available at www.bobcat.com/rubbertracks.